The O.C. 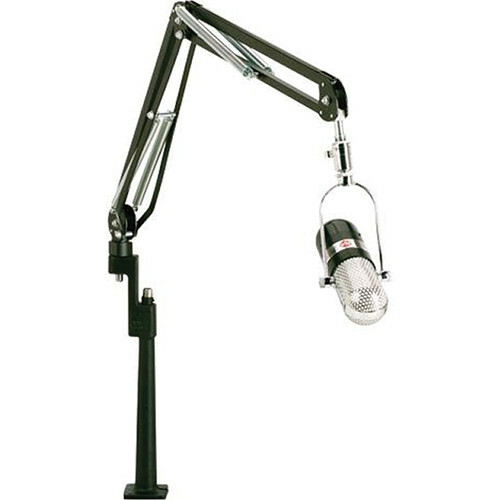 White ProBoom Elite Microphone Arm System is a complete, professional articulating microphone arm for broadcast studios, voice-over production, announcer booths, and more. The system is complete with a two-section ProBoom Elite microphone and a standard 12-inch riser/flush mount. The 12-inch Riser is the flush surface mount for the ProBoom Elite. The ProBoom Elite is elevated 12-inches to provide clearance for additional gear. The ProBoom Elite features noise-free springs that secure heavy microphones in-place while providing quiet microphone positioning. A hidden cable channel is featured for running microphone cables. Box Dimensions (LxWxH) 22.0 x 7.0 x 4.0"
ProBoom Elite Microphone Arm System is rated 4.0 out of 5 by 1. Rated 4 out of 5 by The Mench from Professional miking gone wild! I use the product for doing voice-overs. The ProBoom is very well constructed and the microphone can be positioned just about any position that you need. The only problem that I had was my microphone (Neumann BCM-104) is not heavy enough and I had to remove one the springs on the boom so it would not keep springing back up again. All-in-all, it's a great system and I would highly recommend it to anyone who's looking for a professional microphone arm.